This is the view from where i sit. A pretty big mountain right infront of me. Haha! Last weekend was productive - It was Spring Cleaning weekend. To de-clutter for receiving the coming Chinese New Year! I re-arranged and threw out (donated) 1 bag-full of clothes to make way for the clothes i somehow "acquired" these few months. As it is, the cupboards are bursting to its seams with clothes.Also, I managed to do the much-needed filing which I've been procrastinating for the past year. Now the table is freer from bits of salary slips, papers lying around. CNY is just around the corner and I do LOVE this festive season. (Of course i loved it more when I didn't have to give out ang-pows. Damages are quite severe!) I like CNY because it's one of the rare time that all my close relatives will get to congregate together from overseas and catch up on each other's lives. And yesterday while reading the papers, I came across this article abt this centenarian who misses firecracker, it reminded me of the days when firecrackers weren't banned. I do miss slightly the "noise" and hustle and bustle of how CNY used to be - firecrackers going off everynight for about 2 weeks.. But am also glad that now, I get peaceful sleep most of CNY. However, I don't quite like the hot weather that comes with CNY though- scorching. This will be my last week of work. After which I'd be a free-bird again. It's bittersweet for me. I love working but I do not mind a long break as well. And of course carrying a baby AND working at the same time can put a toll on someone. I salute those who works till the day they deliver.. I don't know how they do it. Went for my week 21 scan on Sat and little baby chose to cover her face with her hands! But i did get a peek into her nose and mouth.. it's still too early to see her face though. My obstetrician says Week 26 and above will be ideal. 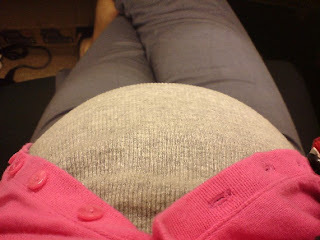 Well, I'll just hv to wait for the 24 weeks 3D and 4D scan! Can't wait to usher in the Golden Year of the Pig! 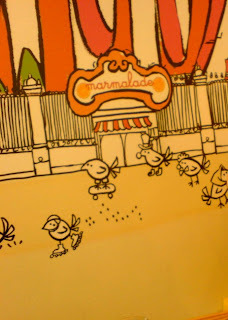 Rollerblading and skateboarding chicks @ Marmalade! Today, the boys talked techy, I had NO input what-so-ever into the conversations, sorry Prav! I've warned you about the blank look if you want to "pick my brains" on technology. > New developments at work, unfortunately I am turning it down. > Weather's lovely - breezy with low sunshine. Hope it lasts till after CNY! > Met the other musketeers for lunch - Always a highlight!